The Lock Haven University Physician Assistant Program represents the first Master Degree entry level program within the Commonwealth of Pennsylvania. 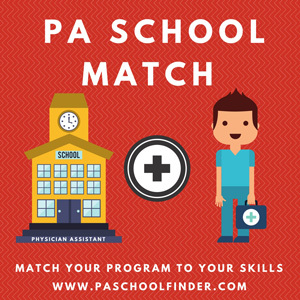 The 24 month program leads to a Masters of Health Science Degree which is awarded by Lock Haven University, and a certificate as a Physician Assistant. With four locations, Lock Haven University Main Campus, Clearfield Branch Campus, Dixon University Center Campus in Harrisburg, PA, and Charles Cole Memorial Campus in Coudersport, PA via distance education (Instructional (Internet, interactive) TV delivery), the LHUP program offers students a high quality affordable educational experience. The College of Health Professions (CHP) serves the state of Arkansas as the primary arm of the University of Arkansas in offering programs that provide education, service, and research in the allied health professions. The College was organized as a separate college within the University of Arkansas for Medical Sciences in 1971. MBKU will offer a 27 month Master of Medical Science (MMS) degree for the Physician Assistant program. PAs are health care professionals licensed to practice medicine with physician supervision. As part of their comprehensive responsibilities, PAs conduct physical exams, diagnose and treat illnesses, order and interpret tests, counsel on preventive health care and assist in surgery.